For the neck rings (I’m going to go ahead and admit, I didn’t make these, it was Mario’s mom’s genius self who figured them out, but she did surprise us with them when we had planned on making our own) we sewed gold fabric around thick cord, and cut them into several lengths so that they would sit on my neck and go all the way around. The one on the bottom was the longest, going up to the top which was shortest, and it wasn’t so tight that I couldn’t breathe. 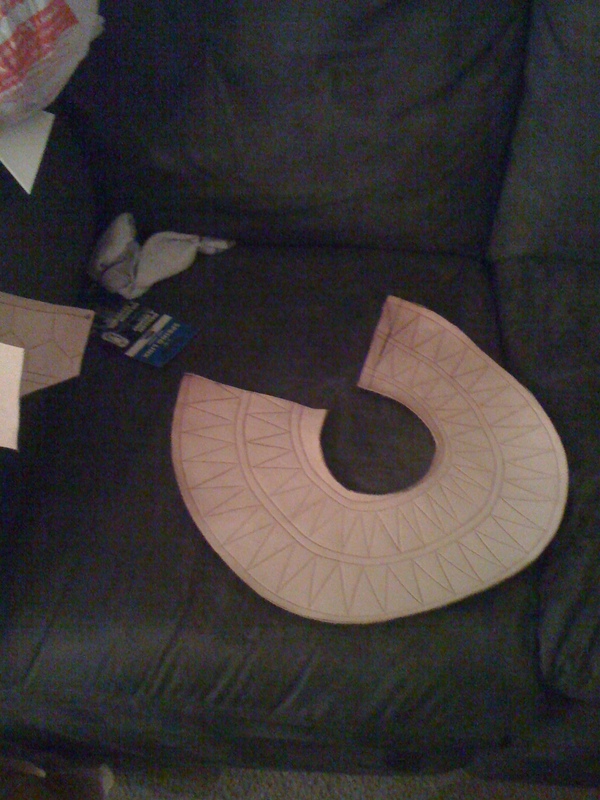 If I did anything differently on this costume, I’d sew some more lines up the length of the inside of the rings, to hold them in place, because I did have to adjust them several times in the day. 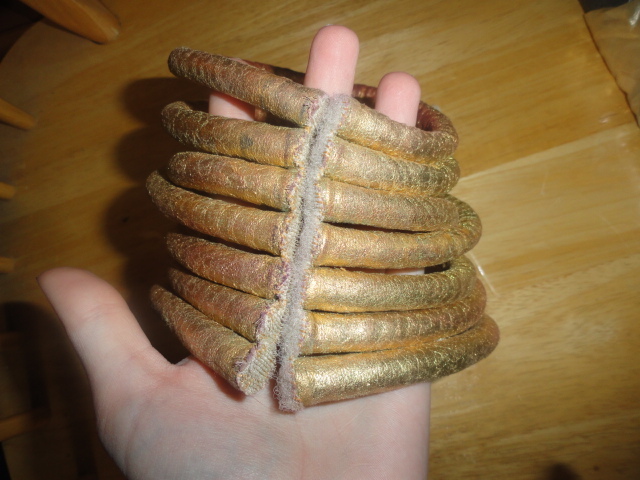 Then we put the rings in order, sewed up the back on both sides of the ends, and added velcro. 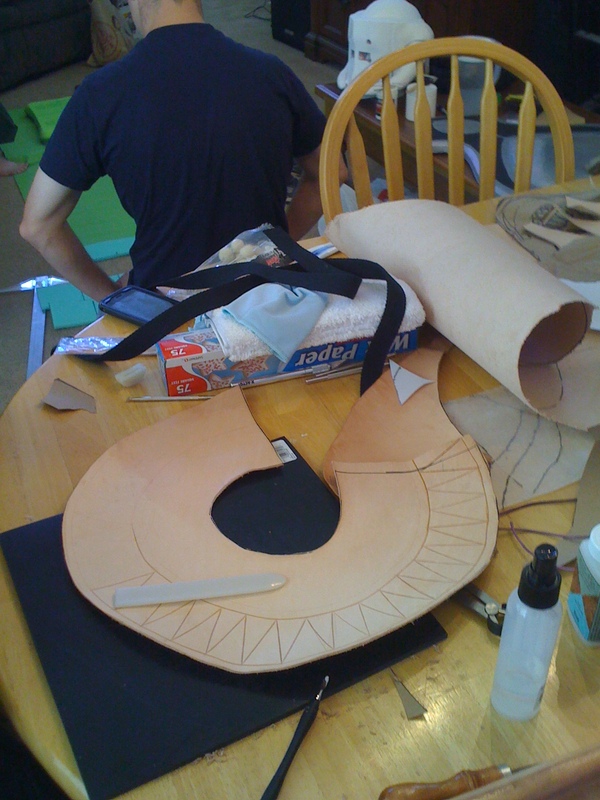 We decided leather would be the best material for the collar, and since we had a ton of the stuff laying around from Mario’s Witch Doctor, we made a simple pattern on paper, adjusted it until it had the right shape and would sit on my shoulders the right way, and then traced that onto leather and cut it out. Mario then spent a whole lot of time spacing out the lines on the leather, he drew them in first and then went in with his leather tools and engraved the lines into the leather. Here it is with the entire design carved into it. 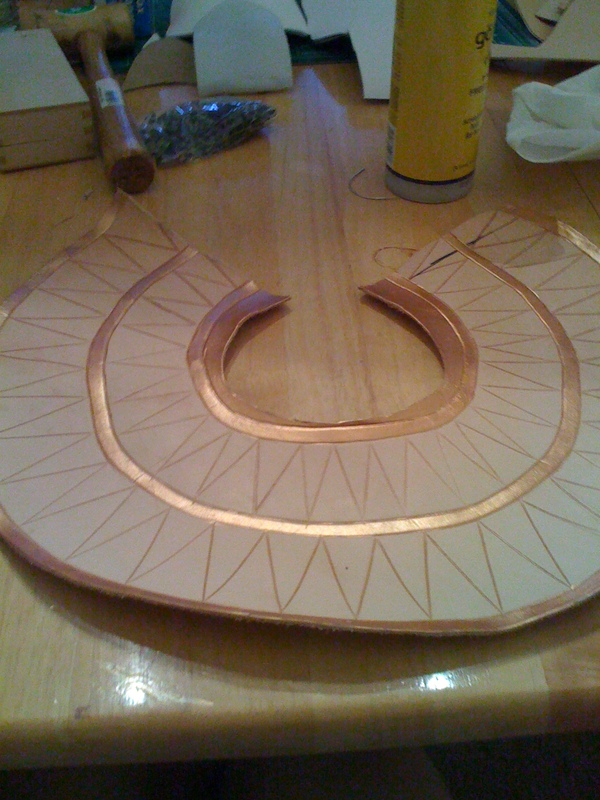 I then went in with a small brush and gold paint to paint the lines first, then the triangles. This paint is THE BEST. 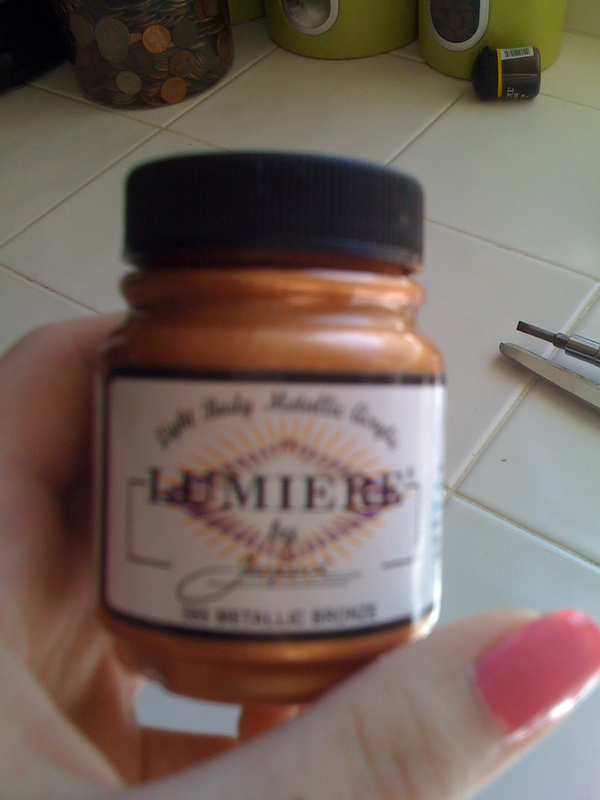 We used it on all of our leather pieces that required gold, and it covered beautifully in one layer. Pretty! 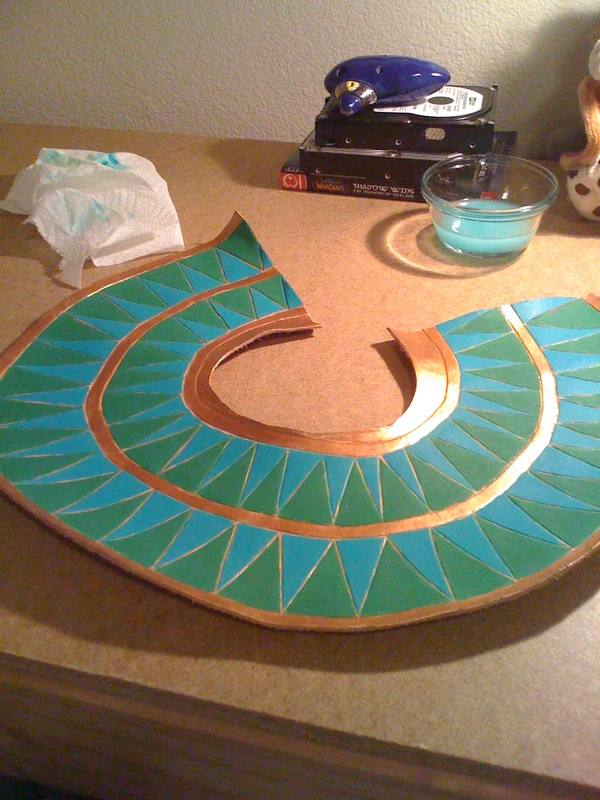 For the blue and green, we just used standard acrylic paint. We had found some Jaquard paint that matched the colors, but they didn’t like the leather as much as the gold paint did, because they were a different type. Wow, my desk hasn’t been that clear in a long time. Anyway, here it is with it fully painted! I felt like something was off, though, and I didn’t like how the lines in between the paint looked, so I took a paint marker in gold and very carefully drew over all of the lines that were tooled into the leather. 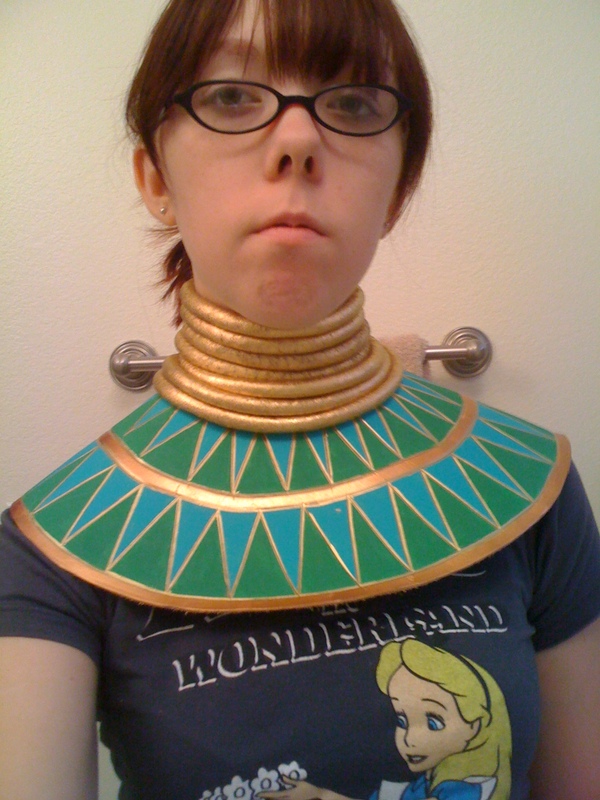 COSPLAY IS SRS BUSINESS! But no, that’s my ‘is this thing working? Look serious!’ face. Anyway. The necklaces! 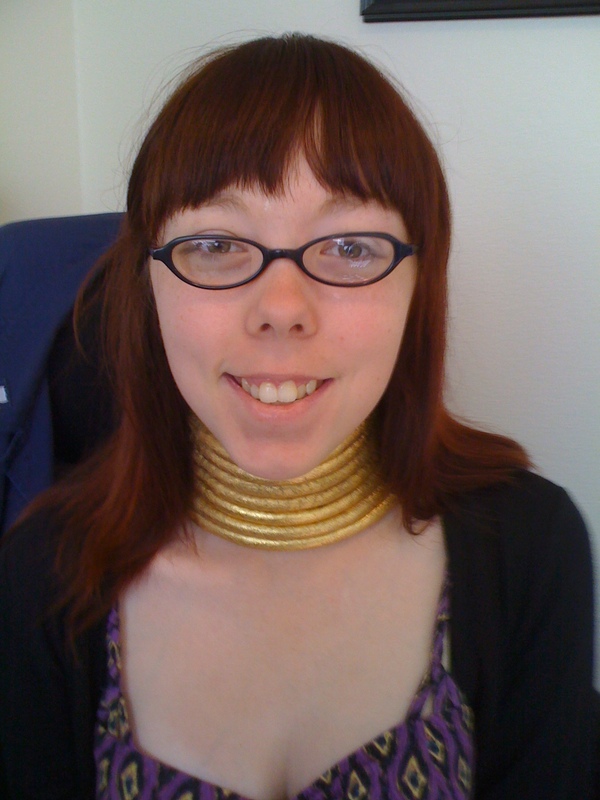 If you look at the picture, she has three necklaces on. 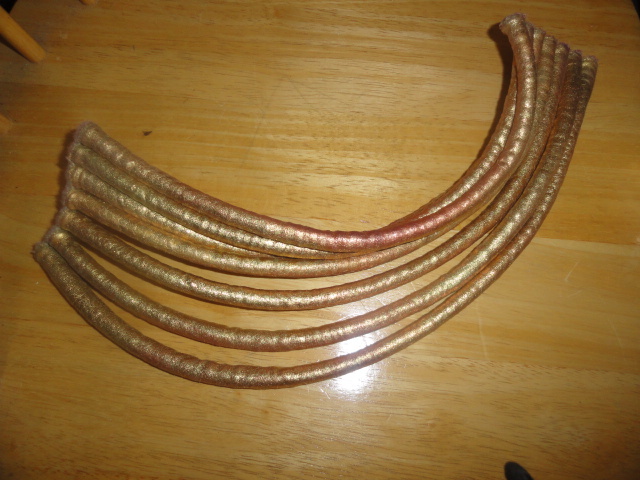 One is a simple gold string with a small skull of some sort on it, one is covered with beads and has a big gold/green bead at the bottom, and one is… red or purple with teeth/claws hanging off. 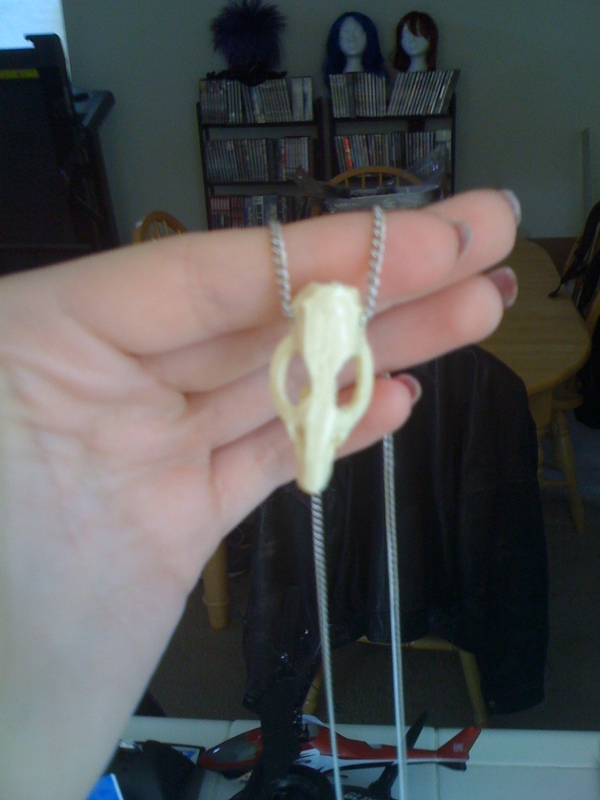 For the one with the skull, I simply ordered a skull necklace from Etsy and transferred it from the chain it was on to a black cord. With the tooth necklace, we were lucky enough to stumble across one at Walgreens around Halloween time, and bought it there and then modified it a bit (it had something hanging from it in the front, I forget what) and repainted the teeth to look more realistic and less fake and Halloween prop-ish. 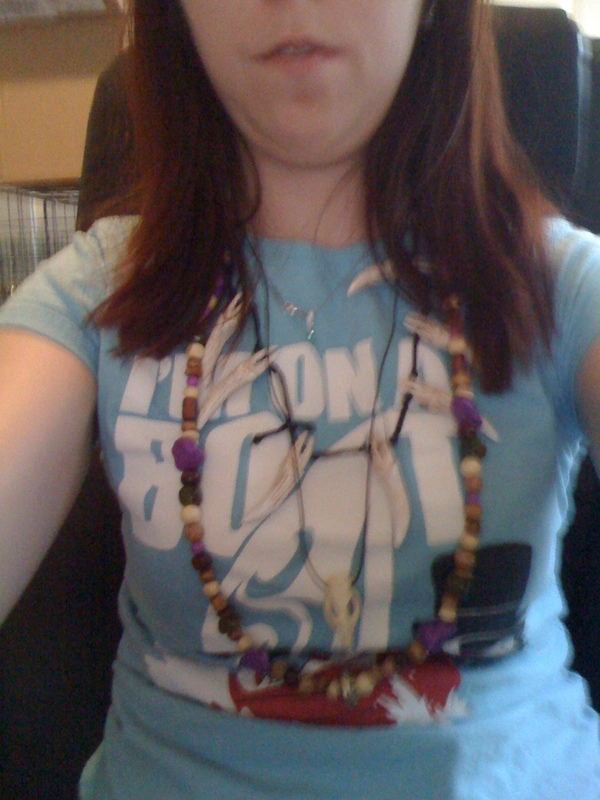 The beaded necklace I put on a stretchy string, and used the beads that I used for my skirt, in addition to a large gold one I found for the one large one in the front, and voila. Easy peasy. 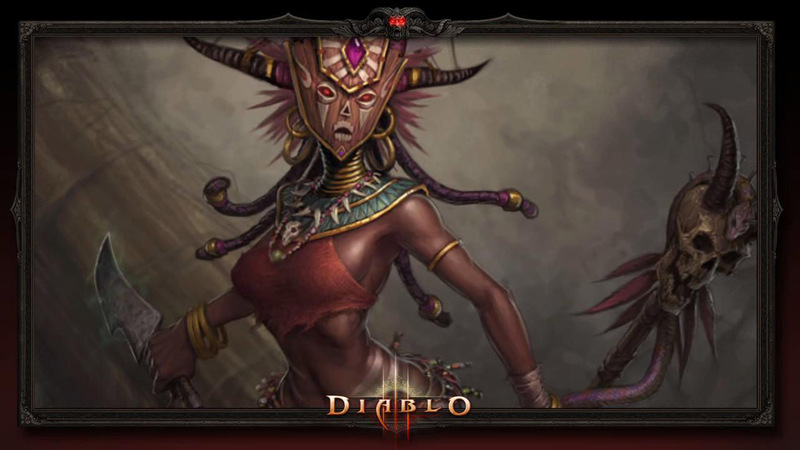 This entry was posted in Conventions, Cosplay, Female Witch Doctor, Tutorial and tagged concept art, cosplay, costume, diablo 3, how to, necklace, skull, tutorial, witch doctor. Bookmark the permalink. How did you make the mask because if you posted how i can’t find it anywhere and thats what i’m looking at mostly. You guys did such an awesome job! I definately have gotten some great ideas! Thank you! 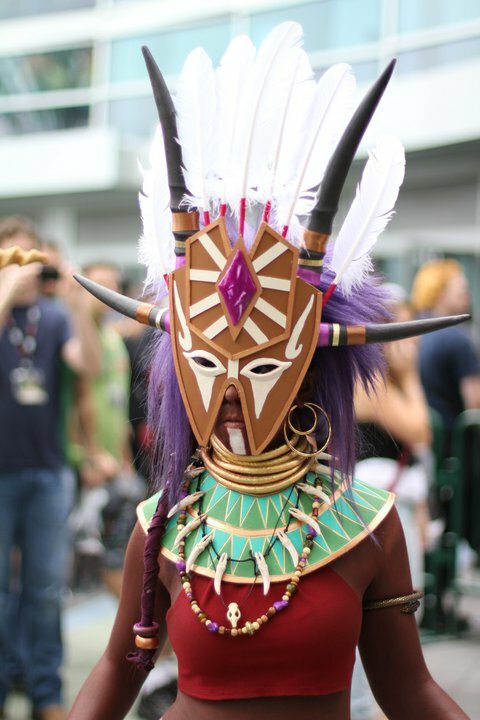 The post is here: https://tripleacosplay.com/2011/04/13/female-witch-doctor-the-making-of-the-mask/ but, I will also note- this costume is for sale, if you’re close to my size, with everything except for the staff (unless you’re local), though I can take the skull/snake off and send that as well! Feel free to email us if you’re interested at tripleacosplay@gmail.com.